I was finishing up the skirt from yesterday, glanced at the remaining denim scraps, and they said "Purse." So I went and ate lunch, because if the fabric is talking to you it's time for a break. I wanted to keep the look of the jeans, so I decided to keep the shape of one leg and cut everything else to match that. You'll need two matching denim leg-bottoms and a piece of lining fabric cut double on the fold. 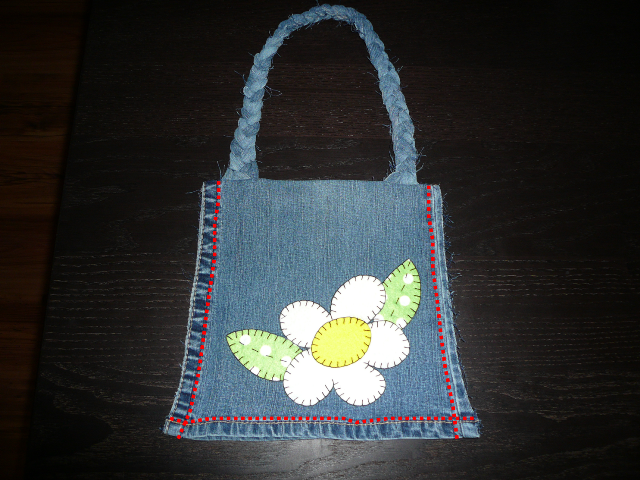 I thought this needed a little extra decoration, so I went for an appliquéd daisy. You can purchase appliqués or make your own. I made this one using felt and Wonder Under. I ironed the Wonder Under onto the back of the felt and drew my design on freehand. You could also trace a pre-printed picture. Cut out the pieces and iron them onto the piece of denim you're calling the front. I'm no expert at embroidery, but this is an easy blanket stitch. It doesn't take a lot of time and I think it's cute. 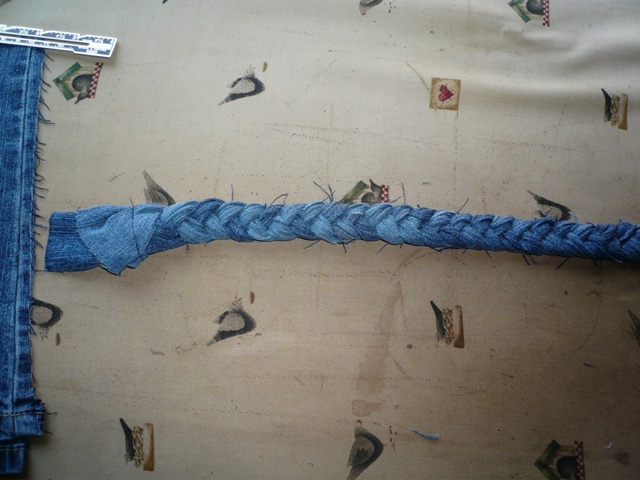 I wanted a braided handle, but none of the remaining pieces of denim were long enough. 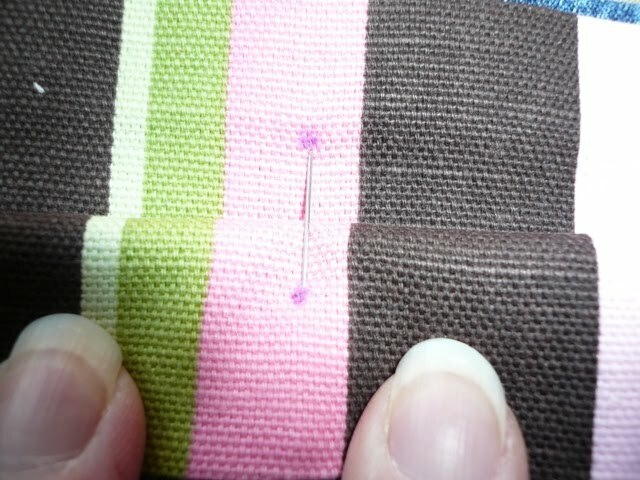 I cut six 2-inch strips, then used this little trick to sew them together without a straight, bulky seam. Lay one piece face up and lay another piece on top of it face down at a right angle. Stitch diagonally, as shown. Trim seam, fold out and press. Layer three of these pieces together, turning one upside down so all three seams aren't together. Stitch across end and pin to a solid surface. Braid together, keeping right side up and curling edges in a little if you don't want the frayed look. Sew ends of handle to right side of front, 1/2 inch from each side edge and even with top. 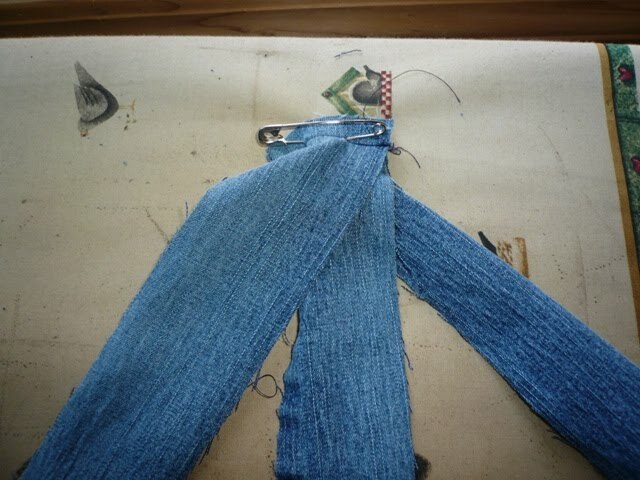 Sew denim pieces to lining piece, upper edges matching and right sides together. Turn pieces right side out and press. Purses that don't have some sort of fastener drive me crazy, so I decided on a magnetic closure I've had floating around for a while. It turned out to be really easy to apply. You could also use a small piece of Velcro. Stick a pin through all layers at the spot where you want the closure. Pull open and mark with a pen on the right side of the lining fabric. 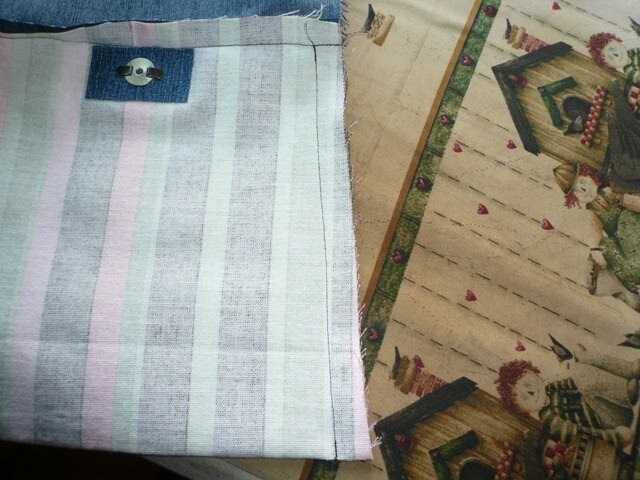 Using Wonder Under, apply a small piece of scrap denim to the wrong side of lining fabric directly under your marking. This will provide some support for your closure. Back to the right side of the lining, use the piece shown to mark the two slits for the closure. Cut through the slits using a small pair of sharp scissors. You will only need tiny cuts - the fabric will stretch or you can make them bigger. Once they're there, you can't make them smaller. 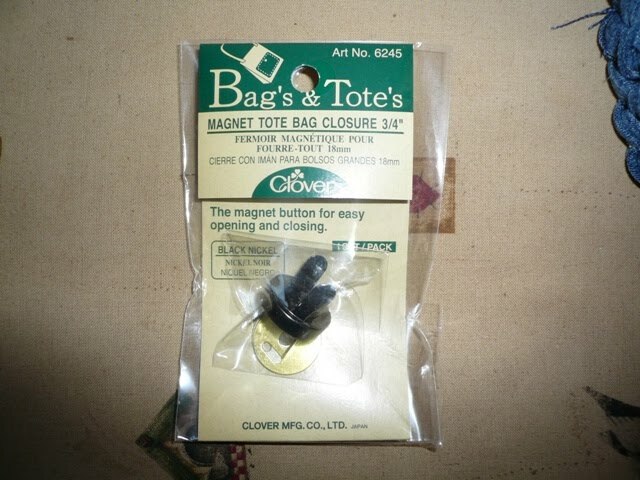 Apply the closure as shown on the package, closure on the right side, this on the back. Stitch the lining closed, right sides together, from the upper seam to bottom fold. Trim seams, angling near the top. Stitch denim together at sides and bottom, raw edges out. Don't worry about catching the lining in your stitching. You probably will and it will help hold it in place when you pull things out of your purse. You can unravel the edges with your fingers and clip the strings, if that's the look you're going for. Believe it or not, I still have one small piece of denim left from these jeans. Maybe I can get one more project out of them!